The radiant heater IR 2010 impresses with all the convenient benefits of the IR series. These include the clean, condensation-free, odourless and noiseless production of cosy warmth as well as an even and targeted distribution of the latter without the need for preheating and – allergy sufferers will be delighted – without raising dust. Being a modern radiant heater, the device produces direct heat according to the natural principle of the sun. Seeing as it converts a great deal of the energy input into direct heat, the infrared emitter is particularly energy-efficient as compared to say hot air blowers. 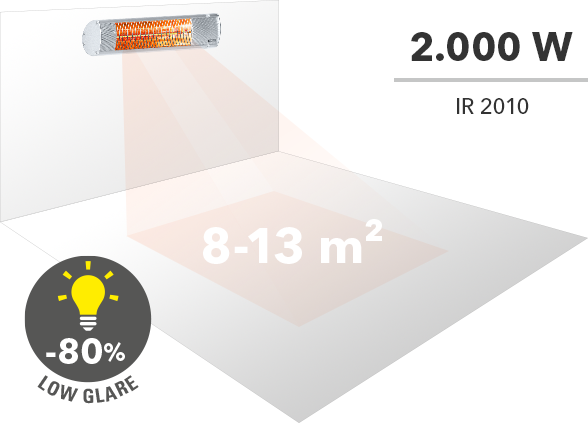 The IR 2010 heats up its direct surroundings quickly and economically thanks to a heating capacity of 2,000 watts and, due to its 90° inclination angle, it can be oriented in both directions to work as a precise heat source. This is why the IR radiator is ideally suited as a standby heating solution, for it can be used wherever targeted heat is required. For start-up, simply plug the device's power cable into the nearest socket. And the professional device IR 2010 has even more to offer: thanks to a reduced light emission, the radiant heater provides feel-good warmth and a pleasant candlelight atmosphere both in private households and in the catering sector. This is made possible by the innovative low-glare short-wave infrared tube that reduces the bright red light, which is frequently perceived as disturbing, by up to 80 % – while maintaining 100 % heat intensity. The result is absolutely discreet light that hardly influences the existing lighting concepts. With an average lifetime of up to 6,000 hours the IR 2010 emits pleasant warmth over several heating periods. The IP65 rated device has a slim and elegant design accommodated in an indestructible aluminium housing. The radiant heater is protected against water jets from all sides (IP65) and is therefore suitable for any outdoor application. You can expose it to harsh weather conditions (rain, snow etc.) at any time. This makes the device ideal for terraces, bars and hotels, or wherever heat is required outdoors despite rain and snowfall. Since the same applies with regard to dust, the device can also be operated both in dusty workshops and industrial buildings without sustaining damage. The IR 2010 is supplied in TÜV-tested quality, thus guaranteeing high value, safety and functionality and making sure that you are always on the safe side with Trotec brand quality. With a width of 595 mm and 2,000 watts of power the IR 2010 can provide infrared heat for many possible applications. The infrared radiant heater can be easily attach to the wall using the wall holder supplied with the device. Using the switch positioned on the side of the device, you can single-handedly switch the infrared radiant heater on or off without much effort. Do not let cold evenings put a stop to a cosy get-together on your terrace or balcony. The IR 2010 is perfectly suited if you want to spend a good time in the open air during the time between seasons. The infrared radiant heater IR 2010 allows you to relax on your roofed over terrace despite bad weather.